New Delhi: With his short international career affected by multiple injuries, Sameer Verma wants to focus on remaining fit as setting specific goals according to him is an exercise in futility. Sameer lifted his first title of the season at the Swiss Open Super 300 tournament, beating former world No 2 Jan O Jorgensen of Denmark in the finals at Basel, Switzerland. However, the Indian says he doesn't want to make plans for the season ahead. "I just want to stay fit, take care of my body, that is my target. I don't want to think about anything else. I know if I am 100 per cent, performance will come and my ranking will also improve," Sameer told PTI over phone. "I keep talking to my coaches and physios how to better take care of myself. I have realised that I was doing over training, which I have to avoid and think long term." Even last year, Sameer had started on a promising note, winning his maiden Syed Modi International Grand Prix Gold event in January and reached the quarterfinals at the India Superseries. However things went downhill from then onwards as he sustained a shoulder injury that forced him to withdraw from Indonesia and Australian Open in June. He recovered and got an unexpected entry at the World Championship but he lost early before reaching quarters at Korea Open but again a recurrence of shoulder problem sidelined him for the second half of the season last year. He had cracked the top 20 but he again slipped out. After regaining fitness he played at the PBL and then started the season at Indonesia, which he suffered early exit. 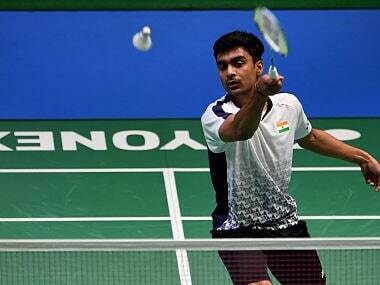 However, a quarterfinal finish at India Open and a good outing at ABC has fuelled his desire to succeed. "I have been getting result after coming back from the shoulder injury. I did well at India Open, so it gave me confidence when I came here," said the 23-year-old, who had won a bronze at the world junior championship, before injuries ruined 2012 and 2013. "It was a tough tournament. The first round was close but the quarterfinal against Kento Momota and semifinal match were toughest and gave me a lot of satisfaction as I pulled them off. I will carry this confidence in rest of the season," he said. While he missed the berth at the Commonwealth Games and is currently in the reserve list for All England Championship, Sameer wants to play at the Asian Games. "I'll take a break now and train for few weeks before playing at Orleans. I was in the reserve for All England but I don't think I'll get a chance to play. I missed the Commonwealth Games and so I am eyeing the Asian Games now," he signed off.